Hello everyone, today is day fifth of my Reader's Response week. Today's genre is YA Horror, and the book that I have chosen to take a better look at is Bruised by Justin Holley. If you want to find out more about why this week is happening and a little bit about this feature, check out my launch post for the Genre of YA Fantasy. Description:Jason Hylden thinks life is perfect, but at age eighteen things are about to change. First he falls for Jewel, a pretty redhead with arms marred by mysterious bruises. Then the gang of friends he runs with begins to experiment with witchcraft, blood oaths and revenge. Soon, Jewel is the only good thing standing between Jason and the gang, but when he finds out she’s one of his mother’s mental health clients, he worries doctor-patient confidentiality will forever mask the truth behind Jewel’s bruises. Is someone out to destroy her, or is she destroying herself? In the end, the truth behind her secrets is beyond his worst imaginings and, as their two worlds draw closer to collision, all hell—quite literally—is about to break loose. Sabrina: Hello Justin, thank you so much for joining me today and answering some of my questions. Sabrina: Jason has this group of friends of which he slowly starts losing contact with because of Jewel. From the author’s point of view do you feel that there ever could have been a way for both parts of his to mingle? Justin: On a personal level, I really wish this crossover was possible. However, Jason’s personality won’t allow for it. He’s scared of the need to manage the pieces of his life he feels are disparate. This includes Jewel and his other core friends/family and later with Lindsey and Tracey, and further along yet with his father and uncle and Tracey. Jason always feels compelled to keep the disparate pieces in silos, avoiding awkward social interactions. This is a fundamental cog of his personality. Sabrina: Jewel was sometimes an out of control character, was this something Jason needed in his life to help him somewhat gain control of his life? Justin: Talk about cogs of someone’s personality! Yes, indeed, Jason, even though he finds the disparate pieces stressful, feels compelled to chase them down and silo them up. It’s not so much control he seeks, but absolution for his own guilt complex. He feels he owes the world and thus tracks down the “out of control” elements and attempts to reign them in and fix them. These include both Jewel and Tracey, and the situations they find themselves embroiled in. Sabrina: Entity’s and spirits play a role in the plot of the story, was there additional research you needed to write scenes about this book. Justin: Oddly enough, not really. I did research the odd thing now and again, however, having spent several years now investigating the paranormal, I was able to write from a base of knowledge I already possessed and fictionalize it. That helps! Sabrina: Readers finish Bruised with significant character dying, do you feel like this was the approach needed in order to showcase how Jason’s character developed throughout the story? Justin: It was a part of the overall series arc, yes. I needed Jewel as a ghost later, so that was my only play. Strangely, I regret her dying now. I really do. I truly enjoyed writing her character and writing her as a ghost is not the same. I am toying with an idea for a fourth book that would possibly provide me another opportunity to write her character more fully. And it would really throw Jason for a loop! That will be sometime well into the future, however, as I’m concentrating on some other, non-related, projects at the moment. Sabrina: Thank you so much for joining me and giving me the chance to find out more about Bruised. Justin: Thank you, Sabrina! Not only for the interview, but for the reviews and encouragement over the last few years. You’re an asset to the book world…please keep at it. 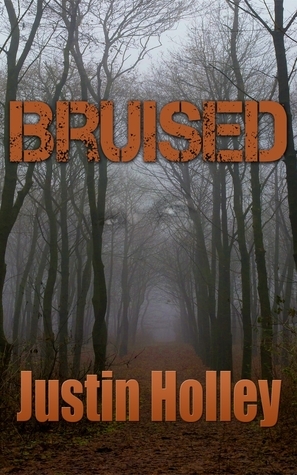 I enjoyed reading Bruised. There was the right amount of suspense along with sadness and happiness. The characters also played a role in helping the story line. However, there were some confusing things that I don't think were ever really touched based on. Now onto the characters. I actually really liked the characters, however I had some issues with the way they were written. I found the main character Jason to be written as like a 15 to 16 year old, I wouldn't have pictured him to be 18. It wasn't that he was poorly executed it was just some of the things he said along with the things he didn't know made him out to be younger. In saying all that, it was really my only issue. The other characters I really thought were written quite well.